Get on the Air Now! 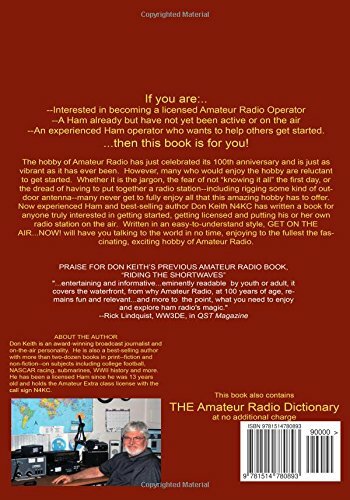 An outstanding resource for amateur radio operators, and new or prospective hams in particular, is a paperback book by Don Keith N4KC entitled, GET ON THE AIR…NOW! There is something for everyone here: Folks who are interested in ham radio, those who just got a license, experienced hams who lose interest, and long-time hams who are looking for something to share with newbies. N4KC covers most of what current and prospective ham radio operators need to know and he does a great job of selling the hobby/interest. And no, he’s not pushing Morse code, although CW operation is one of the more interesting aspects of amateur radio. The main emphasis of the book is encouraging licensees to actually get on the air and experience real ham radio, not to get frustrated with bad experiences and limited equipment and then give up on our hobby. He addresses some of the common discouragements and steers us to realistic remedies. Chapter five is a practical discussion of antennas and I particularly appreciate chapter six with Don’s concise description of what to expect on the HF bands. 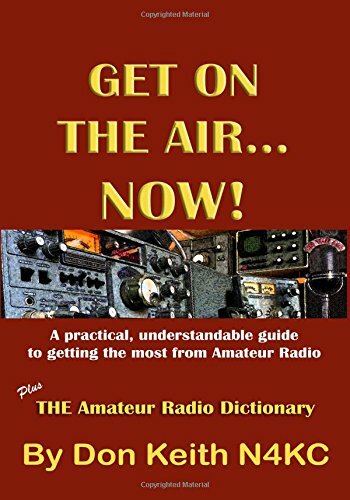 The second half of the book is a comprehensive dictionary of “ham-speak”–amateur radio terms, abbreviations and slang, useful to all hams, new and old. About $19 with a Kindle version for $9. Highly recommended and the first item listed on a new site page entitled Recommended Reading.